Getting used to seeing and hearing ourselves on camera can be a significant challenge, or even a stopping point for many makers. In this episode of Movies for Makers, we share stories and practices from our own journeys both behind and in front of the camera. Plus, we answer live questions and a couple questions that you may have emailed me about previously, too! (1:18) Start by asking yourself: Where is your area of greatest challenge when it comes to being on camera? (2:21) Practicing is really the key to being yourself on camera. (12:00) Work-arounds if you just can’t even go there and put yourself on camera just yet. (13:57) The value that putting yourself on camera can provide for both you and your audience. (27:33) Where is the best place to position the camera and your monitor screen to maintain natural eye contact with a viewer? (32:28) What colors of clothing are best to wear on camera? (37:13) How do you become more energetic on camera without coming across as manic or false? (45:56) How do we practice being compassionate when we edit videos of ourselves? (50:15) How do I figure out what to actually say on camera? Here’s a list of every episode in the first season of Movies for Makers. Experience the live show on Mondays, and episode replays on Tuesdays. 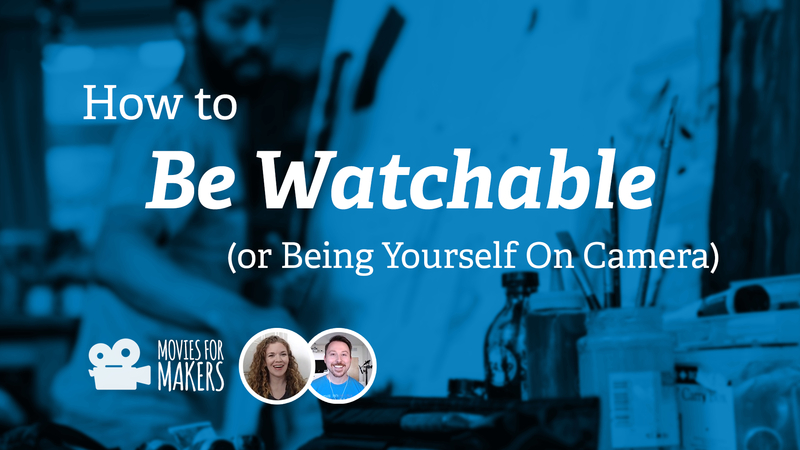 Episode #2: How to Be Watchable (or Being Yourself On Camera) // hey, this is the post you’re on!